Keep your moustache and beard in check with the Proraso Moustache Comb and Beard Brush Set. The brush set will ensure that your facial hair always looks its best. The moustache comb will help you create fun and funky styles for every occasion whilst the beard brush will control any frizz. 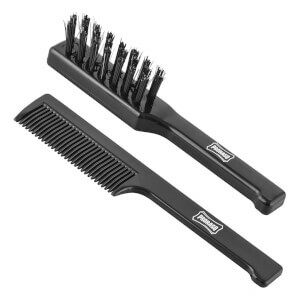 The comb and brush both come in a size of 112mm and with a usable head of 45mm. Groom and style your whiskers knowing that you have the best ‘tache and beard in town. A.B.